Sorry for yet another horrendous camera phone shot, but check it out! 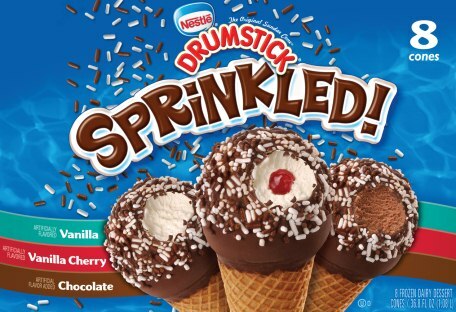 I'm a sucker for Drumsticks so it was hard not to pick up new (for 2010) Nestle SPRINKLED! Drumsticks. The box of 8 frozen dairy desserts includes vanilla, cherry filled vanilla, and chocolate versions. I'm guessing there's gonna be sprinkles all over the floor by the time you're done enjoying one of these. 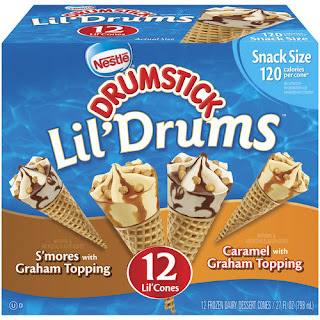 I also spied a new box of Lil' Drums: The new flavors are S'mores with Graham topping and Caramel with Graham topping. Now I wasn't a huge fan of the full size caramel drumsticks, but i'm still willing to use the graham topping as an excuse to give these little guys (and the sprinkled!) a try in the near future (after I get the Blue Bunny Champ review up anyway). Hope everyone has a great holiday weekend! Mine is three days long, WOOHOO! 2013 Update: Wow, apparently I should have tried these because both of them are now gone. 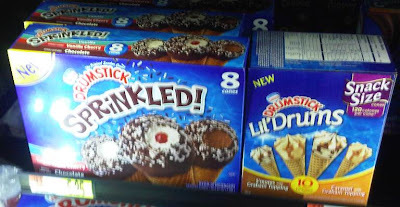 Sprinkled was definitely still around in 2011, and summer 2012 for that matter, but after that at some point, they disappeared. I don't even remember the last time I saw these.